During recent years the seepage has halted and the lagoon has reached capacity. Excess dirty water is becoming increasingly difficult to manage and large quantities are being transported from the farm by bowser, to be spread on nearby farm land. Overall the current system is beyond sensible capacity, is uneconomic and highly unsustainable. The new scheme will treat dirty water (contaminated with cattle slurry) and other uncontrolled runoff from the farm yard, in order to supply a re-usable water resource and create a managed resource for recreational and other beneficial uses. The system will comprise reedbeds, swales and storage ponds, which will treat the water through natural biological processes, for sustainable re-use. Other benefits of the scheme will be a significant reduction in the farm’s demand on potable water, the removal of a substantial number of tractor and bowser movements from the local road network and the removal of a potential pollutant to the groundwater. The sustainability of the scheme is enhanced to an optimal level by using sustainable drainage and construction techniques throughout. 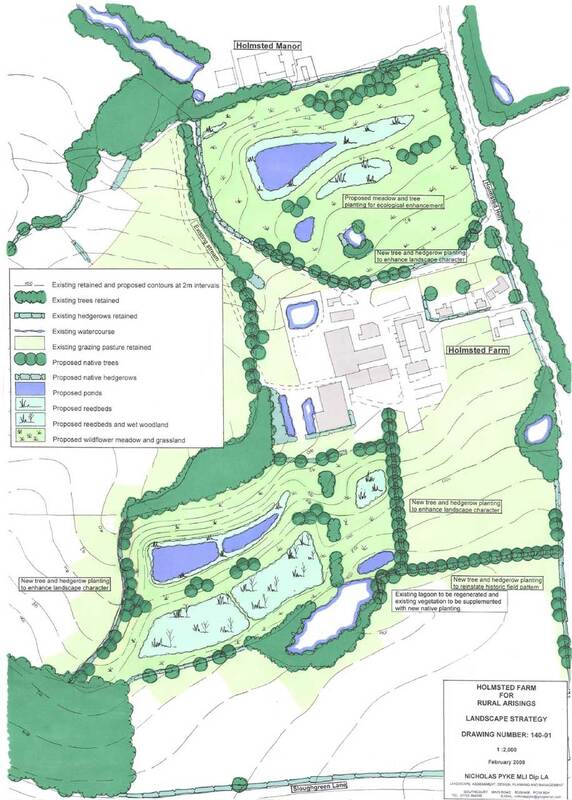 The landscaping will incorporate key characteristics of the surrounding landscape and the pond and reedbed systems will improve the current habitat for many bird and invertebrate species. The reedbeds and ponds will also be used for fishing and to reorganise the existing duck shooting arrangements with the treated water also being used for a range of sustainable tasks including washdown, stock watering, irrigation and substitution of potable supply. The existing lagoon will be regenerated to improve its environmental and ecological status.